Do you struggle with mood swings, anxiety, depression, or other mood imbalances? Have you ever been prescribed antidepressants or other mood-stabilizing medications? If so, you are a part of a rapidly growing segment of the population. The rates of mood disorders and use of mood stabilizing medications have skyrocketed over the last several years. In fact, one in every six Americans is prescribed an antidepressant or other psychiatric medication1. The rates are even higher among women, with one in four American women prescribed antidepressants or other psychiatric medications2. This is both alarming and heartbreaking for a number of reasons. It saddens me to think of so many women struggling with these issues, and it frustrates me as a functional medicine physician that they often feel their only option is to turn to prescription medications. Could candida be affecting your mood? While conventional medicine doctors consider lifelong dependence on prescription medications that often come with a laundry list of side effects3a “solution” to mood imbalances, as a functional medicine physician, my goal is to uncover what’s really causing your mood imbalance in the first place, in order to treat it and allow your mood to stabilize naturally. I do want to clarify that antidepressant medication can be a very helpful tool, particularly in severe cases or while you’re working to identify your root cause, I just don’t consider them the only or most powerful tool in my toolbox for helping patients overcome mood imbalances. In working with thousands of patients in my clinic, I have found that in almost all cases women are able to come off of antidepressants and other mood stabilizing medications and thrive, free of mood swings, anxiety, and depression, after addressing the underlying root cause of their mood imbalances. So what are the root causes of mood imbalances and how can you overcome them? While there are many gut infections and conditions that play a role in your overall gut health, the one I see most often in my patients struggling with mood imbalances is Candida overgrowth or yeast overgrowth. Candida is a fungus, which is a form of yeast, a very small amount of which lives in your mouth and intestines. There are actually many different types of yeast that can take up residence in your body, however, Candida albicans (Candida for short) is the most common and studied form of yeast. Most people refer to all types of yeast overgrowth simply as Candida overgrowth, which is what I’ll be doing in this article. Candida’s job is to aid with digestion and nutrient absorption, and typically the good bacteria in your gut, as well as your immune system, prevent your Candida population from overgrowing. However, when the balance of good bacteria to yeast is disrupted, from taking a round of antibiotics (which kill off the good bacteria), eating a diet high in refined carbohydrates and/or drinking too much alcohol (which feed the yeast), long-term birth control pill use, chronic stress, or numerous other lifestyle factors that disrupt your microbiome, Candida is able to multiply unchecked. The yeast then coats the lining of your intestinal tract, and suppresses your ability to produce or secrete your serotonin. A deficiency in serotonin can cause milder mood imbalances such as mood swings as well as more severe issues, including anxiety and depression. In fact, the majority of antidepressants work by blocking the brain’s serotonin receptors, freeing up more of the chemical to remain present in the brain. If left unchecked, Candida also breaks down the wall of your intestine, which can lead to leaky gut, and penetrates the bloodstream, releasing toxic byproducts into your body. The great news is that once you eliminate your Candida overgrowth and your serotonin levels return to optimal, the mood issues and other symptoms fade away. 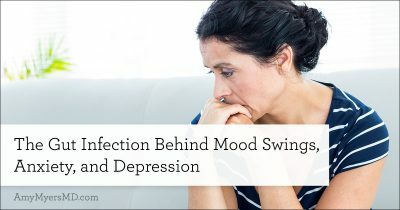 As I mentioned, many women are able to reduce or come off of antidepressants and other mood stabilizing medications after treating Candida overgrowth. (Note: always work with your doctor when changing your dose or coming off of any prescription medication). I’ve helped thousands of patients overcome Candida using a simple proven protocol focused on killing the yeast (by eliminating the sugar that feed yeast and taking targeted yeast-killing supplements) and restoring the good bacteria that keep the yeast in check. You can follow this exact same protocol at home using my 30-Day Candida Control Program. It includes a 30-day meal plan with recipes and shopping lists, all three of the yeast-fighting supplements, and tons of additional resources and videos to empower you to restore your gut health.